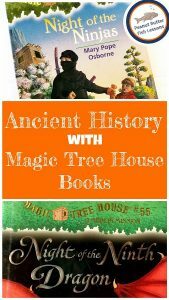 This year we are using the Magic Tree House books as my 2nd grader’s reading ‘curriculum’. I have organized them to correlate with our history and science lessons. 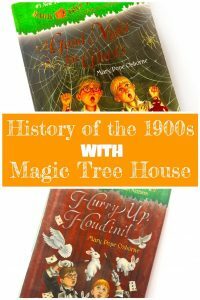 Check out Teaching History with Magic Tree House Books to see why we love these books, how they are organized, and to find some simple extension activities for using them in your homeschool or classroom. 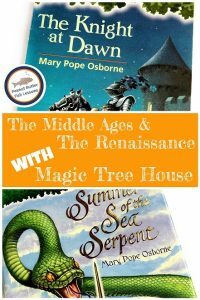 I also explain the difference between the Magic Tree House line of books (noted as MTH below) and the Merlin Missions line of books (noted as MM below). 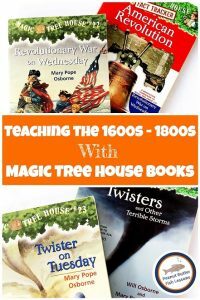 This list contains the books that cover the 1900s in historical order. The continent where they take place is noted in case you are organizing your studies geographically. These books align with Story of the World Volume 4 or other history studies about Modern Times. Your children will learn about a variety of important people and events during this period of time. North America: Hurricane Heroes in Texas (MTH 30): Jack and Annie travel to Galveston, TX in 1900 to warn people of a dangerous hurricane. Fact Tracker: Texas: This book covers major events in the history of Texas, including the Alamo and the Galveston hurricane. North America: Earthquake in the Early Morning (MTH 24): Annie and Jack arrive in San Francisco in 1906 and try to save people from the earthquake that has hit the city. Fact Tracker: Tsunamis and Other Natural Disasters: This Fact Tracker was created to go with High Tide in Hawaii (MTH 28), but has an entire section on earthquakes and would be a good science-based book to accompany Earthquake in the Early Morning. North America: Hurry Up Houdini (MM 22): It’s the early 1900s and Jack and Annie have traveled to Coney Island where they find Harry Houdini. Fact Tracker: Magic Tricks: This book really has nothing to do with history, but it is pretty fun, especially if you have a budding magician in your house. Europe/North America: Tonight on the Titanic (MTH 17): Annie and Jack find themselves on the Titanic the night it sinks. Fact Tracker: Titanic: Learn about the unsinkable ship, why it sunk and why there were not enough lifeboats. North America: A Good Night for Ghosts (MM 14): It is the beginning of the Jazz Age and Annie and Jack travel to New Orleans and meet a teenage Louis Armstrong. Fact Tracker: Ghosts: Learn some famous ghost stories, about ghost hunters, and more. North America: Blizzard of the Blue Moon (MM 8): Annie and Jack head to New York City during the Great Depression to find a unicorn. Europe: Danger in the Darkest Hour (MTH Super Edition): This is the only Super Edition in the Magic Tree House line with an even longer story than the Merlin Missions. It also has extra facts and pictures included. It is the night before D-Day and Annie and Jack travel to England then parachute into Normandy, France. Fact Tracker: World War II: Learn more about World War II and especially D-Day. A great book for explaining this topic to elementary-aged children. North America: A Big Day for Baseball (MTH 29): It is 1947 and Jack and Annie travel to Brooklyn to be the bat boys during Jackie Robinson’s historic debut. Fact Tracker: Baseball: Learn the history and rules of the game and about famous baseball players. North America: Soccer on Sunday (MM 44): Jack and Annie travel to Mexico to watch Pele play in the 1970 World Cup. Fact Tracker: Soccer: Learn the history and rules of the game, as well as more about the World Cup and soccer’s greatest players.